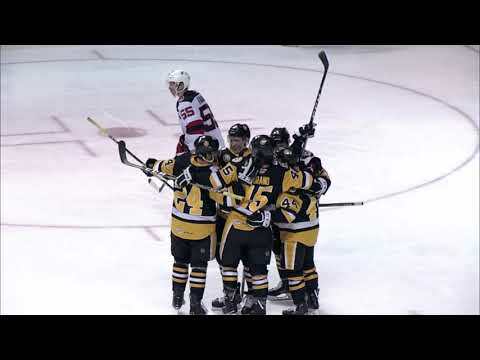 Staring down playoff elimination, Hershey continued the home team’s dominance in the East Division Finals with a 3-0 win over Wilkes-Barre/Scranton in Game 6 on Sunday at Giant Center. Rookie goaltender Michal Neuvirth posted a 30-save shutout for the Bears, who will host the rival Penguins for a decisive Game 7 on Tuesday. The home team has captured each of the first six games in the series, and the Bears are a perfect 5-0 overall this postseason at Giant Center. Andrew Gordon gave the Bears the early lead at 11:35 of the first period when he picked up a loose puck in the slot and fired a wrist shot just under the crossbar from point-blank range. Darren Reid then made it a 2-0 game just 22 seconds into the middle frame with his second goal in as many nights. Reid, who made his 2009 playoff debut on Saturday, faked around a defenseman on the left wing boards and shot one past Pens goaltender Adam Berkhoel to the glove side. Hershey took a commanding 3-0 advantage less than three minutes later as Alexandre Giroux tallied a wrap-around goal on the power play at 3:11. The Bears’ defense took over from that point and held Wilkes-Barre/Scranton’s potent power play scoreless on four opportunities. Neuvirth (7-3) earned his second shutout of the postseason. Berkhoel stopped 40 of 43 shots in the losing effort for the Pens. The Penguins won all three road games from Bridgeport in the division semifinals but are 0-3 at Giant Center in this series. Sunday marked the first time the Pens had been shut out since a 3-0 loss to Albany on Mar. 21, 2008. Wilkes-Barre/Scranton was not blanked during the entire 2008-09 regular season or playoffs to this point. Hershey will appear in its first Game 7 since the 2006 conference finals, when Eric Fehr’s overtime goal at Giant Center eliminated Portland and sent the Bears on their way to the Calder Cup championship.